Music, photos, videos, personal and business files - these days we want access to our stuff wherever we are. With a SanDisk 4TB USB flash drive, now you can have it in your pocket. Western Digital's SanDisk unveiled several new external storage solutions including a new 4TB USB-C Prototype drive at CES 2019. The 4TB option is the world's highest capacity external USB drive and it can simplify the way consumers share their personal content on the go. Not bigger than the size of your thumb, the 4TB drive, at the moment, is just a prototype and thus it's not yet for sale. However, even if it was for sale, it would have been out of the reach of most of us. The cost of a regular 2TB flash drive is over $1,000 so a 4TB would surely be prohibitively expensive. 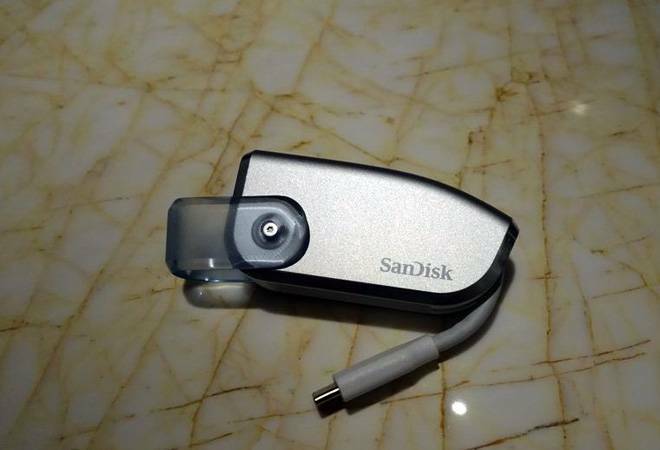 There wasn't any mention of the specifications of the flash drive by the company but the main intent behind displaying it was to showcase the possibilities and technological prowess of the SanDisk and its flash drive solutions. How much can a 4TB drive store? Assuming that an average song takes up five megabytes, four terabyte could fit approximately a million songs! How many songs are you carrying with you right now? You could fit approximately 2,000 hours worth of movies on four terabyte. Assuming each movie is roughly 120 minutes long that would be about 1,000 movies! You can also fit 12,40,000 photos in 4 TB drive. All of these numbers can further increase depending on the compression you choose to use. SanDisk also unveiled its Extreme Pro Portable SSD, at the CES 2019 tech fair in Las Vegas. According to the company, the Extreme Pro Portable SSD can offer transfer speeds of up to 1GBps and comes with IP55-dust protection rating. The company is planning to launch it during the spring in the US in 500GB, 1TB, and 2TB capacities. SanDisk announced a cloud based backup service for its two USB drives, SanDisk Ultra Flash Drive and the SanDisk Ultra Fit Flash Drive, at the CES 2019. It offers a cloud backup option that allows users to sync the content of their drives and view files even if their drive is lost. Launched under the Western Digital brand, My Passport Go features a built-in USB-A cable and transfer speeds of up to 400MB/s.